We are huge Guardians of the Galaxy fans, we don't often go to the cinema but we made sure to go and watch Vol 2 as soon as it was out and let me just say it if you haven't seen it yet then you must rectify that ASAP. 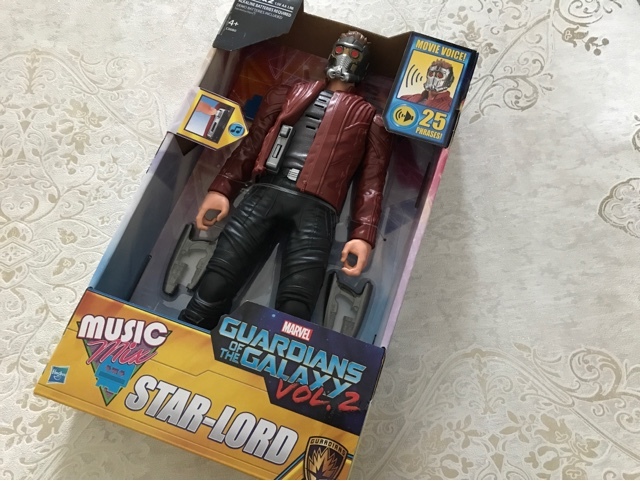 Any way to coincide with the release of the film I was kindly sent the Electronic Music Mix Star Lord for the kids (and myself) to review. 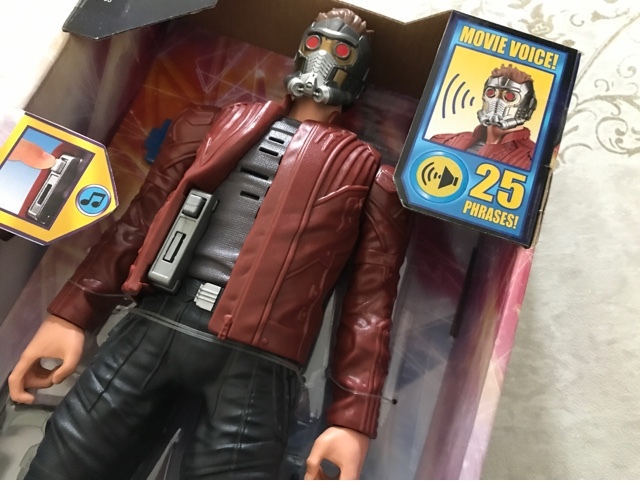 With this toy Star Lord is ready to battle, blast and jam it out. Coming complete with two blasters, a mix tape and of course the instructions to help you make the most out of your toy. 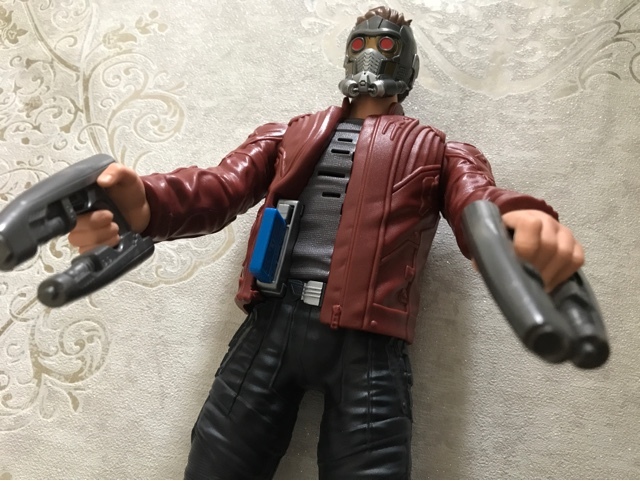 This is one of my favourite characters from the movie, yes it does help that he's played by Chris Pratt and I have to say this figure is pretty detailed. Taking 2 AA batteries, it can be played with straight out of the box. The toy stands at around 12 inches tall and is made entirely from plastic. One thing that I think let it down was the fact that the mask couldn't be removed from his face. His arms move around but his legs are static, this does make it easier to stand him up. Pressing the button on the cassette player he says around 25 phrases and it is his voice not some imitation. Then when you insert the mix tape into the cassette player when you push the button he then goes on to play music from the films soundtrack. This is one toy I don't mind my kids continually pressing! There isn't an on/off button and there is no volume button either but as I said if you enjoy the movie then you really won't mind the repeated sounds. There was something else that I worry about with this toy and that is that the little blue cassette tape will get lost, but this is something that can't really be helped due to the design of the figure and thankfully phrases will work even without the tape. 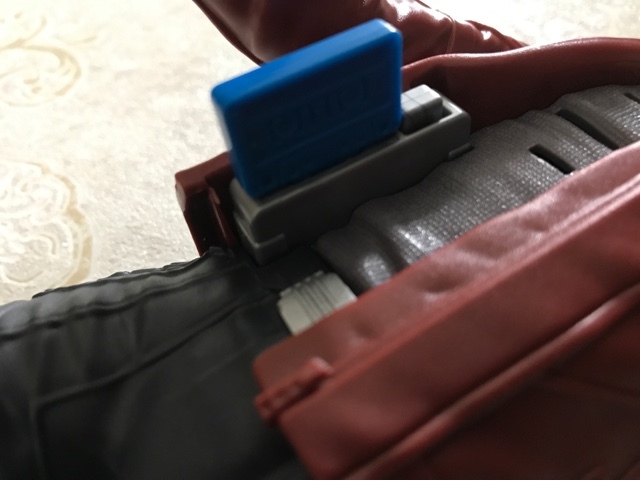 I mentioned at the beginning that Star Lord also comes with 2 blasters, these fit neatly into his hands (I did need to help as it's a tight fit) and because his arms raise up it's easy to pretend that he really is ready to shoot his enemies, I won't say who his latest enemies are just incase you haven't seen the second film yet. 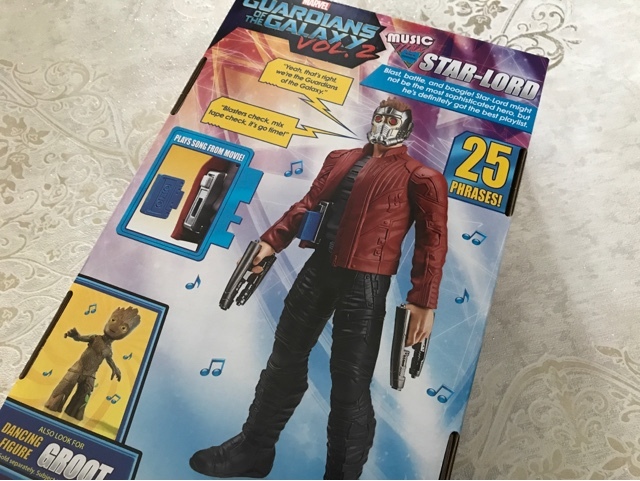 Star Lord is definitely one groovy hero, I adore his playlist and this toy definitely goes to demonstrate how fantastic that music is to listen to. What I love about the Marvel films and the toys that go with them is that they aren't aimed at a specific gender, girls and boys, men and women can all enjoy them. 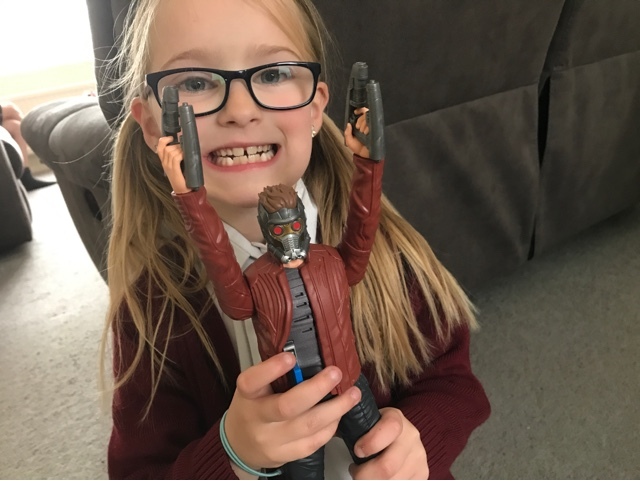 The Electronic Music Mix Star Lord lets your child (and you if you want) re-enact the film and lets them imagine who their favourite hero could be saving next. We can't wait to build up our collection of these toys, my kids are in agreement that we really would like to have a dancing Groot next, who's your favourite character from Guardians of the Galaxy? How old is your daughter? We took our 4 year old and she loved it.